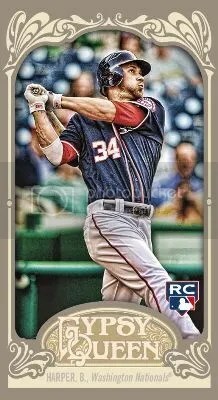 Throughout the National, certain booths will have a limited supply of Beckett Cover Cards. Anyone who brings the Frank Thomas Beckett Cover Card featuring the Historic Autographs name on the back to the Historic Autographs booth will receive a 21-card set of 2013 Historic Autographs Originals, 1909-1912 with players such as Harry Hooper, Ray Schalk and Max Carey. 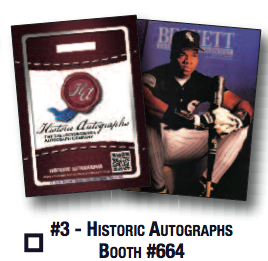 Any box of HA product purchased at the National and brought to the Historic Autographs Corporate Booth (#664) and opened there will receive a compete 21-card 2013 HA Originals set. Any of the “National Promotion” boxes of Ball of Fame II or Five Boroughs purchased at the National, [and has a “National Promotion” sticker], and opened at the booth, will get an autographed item from a Hall of Famer (keys to include Ted Williams, Nellie Fox, Clark Griffith) plus a complete 21-card 2013 HA Originals set. These Ball Of Fame II and Five Boroughs boxes need to be new purchases, not from your existing inventory, prior to the National, and will come with our “National Promotion” sticker affixed to the box to distinguish these boxes from the regular boxes. 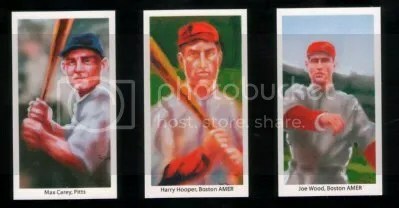 Earlier this week Upper Deck gave us a peak at their 6-card set that VIPs attending the 2013 National Sports Collectors Convention would receive. 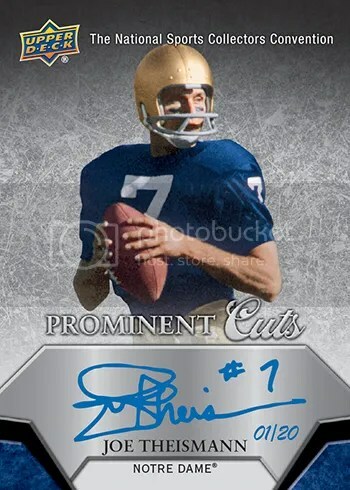 Now we get into the real meat and potatoes – Upper Deck’s wrapper redemption programs. Although I don’t see any special Precious Metal Gems parallels or Animal Kingdom patch cards being made, Upper Deck seems to have a whole bunch of activities planned. 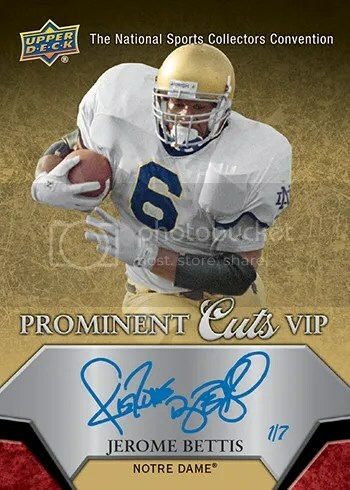 Wrapper Redemption Program – Collectors just need to purchase five (5) packs of 2013 SPx Football, 2013 Upper Deck Football (Hobby), 2012-13 SP Authentic Basketball, 2012-13 NHL SP Authentic or 2013 Goodwin Champions OR two (2) packs of 2012 Fleer Retro Football, 2012-13 NHL Fleer Retro or 2012-13 Fleer Retro Basketball to receive one (1) 2013 Upper Deck National Sports Collectors Convention Pack. These five (5) card packs must be purchased from a Certified Diamond Dealer who will provide collectors with an Upper Deck issued voucher for the redemption program. The program will begin at different times each day starting on Thursday and run as long as supplies last. Collectors can take advantage of the promotion up to four times per person, per day. Saturday (10 a.m.): Tiger Woods, Bobby Hull, Reggie Jackson, Pete Incaviglia, Ken Griffey Jr.
Collectors can look for randomly inserted autographs too. (1) Case Breaker Raffle Ticket good for a random memorabilia item, trading card or one of five (5) Michael Jordan autograph cards produced exclusively for the National Sports Collectors Convention. The item selected will be immediately available to the participant. 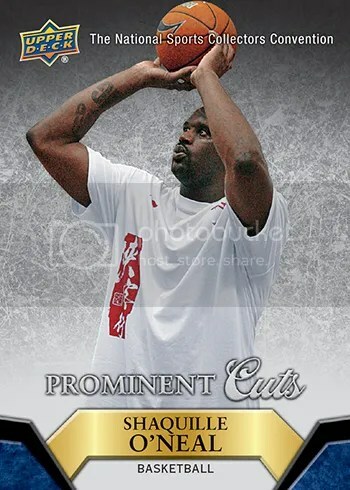 As with the other wrapper redemption promotions, the product must be purchased from a Certified Diamond Dealer at the show who provides the collector with an Upper Deck issued voucher. Collectors can open up to one case, per person, per day at the show. This promotion is limited to the first 25 collectors to take part in the promotion. 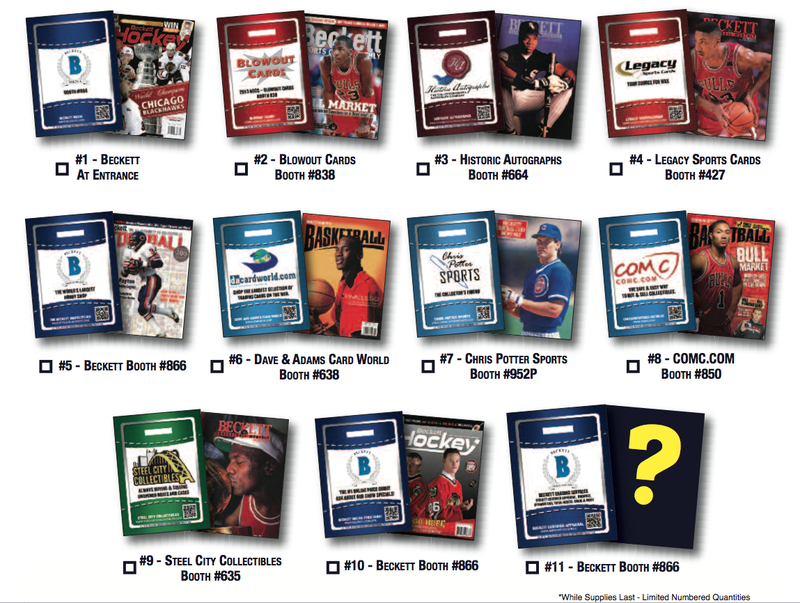 Expired Redemption Raffle – It was just last year Upper Deck rolled out the first-ever expired redemption raffle at the National Sports Collectors Convention and it was a tremendous success so it will be back in 2013. Collectors and store owners may bring up to five (5) unscratched, expired Upper Deck autograph redemption cards to the Upper Deck Corporate Booth by Saturday, August 3 before 10:30 a.m. to take part in the program. Those who wish to participate DO NOT need to attend the trade show. Collectors and shop owners can send in up to five (5) unscratched, expired Upper Deck autograph redemption cards to the address below to participate as well. Collectors who send in their cards need to legibly write their name, address, phone number and email address to the front of the expired Upper Deck redemption card (in the white area) in black or blue ink. Cards not received in time for this event will be carried over to the next Expired Redemption Raffle. 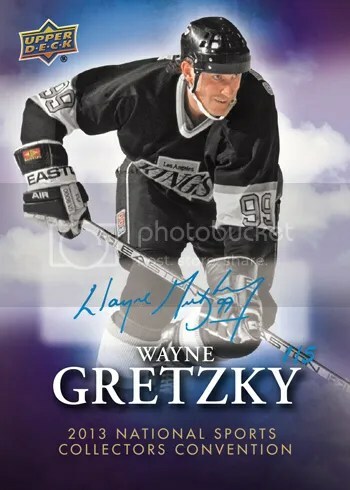 Upper Deck will have 100 PRIZES available in this raffle consisting mostly of limited autograph cards, memorabilia cards, unopened boxes and signed promotional items from Upper Deck Authenticated. What cards are eligible for The Upper Deck Expired Redemption Raffle Program? 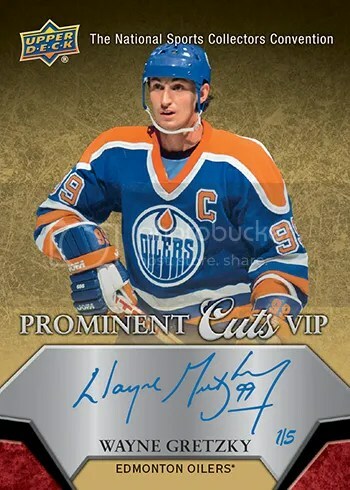 Expired redemption cards must have been manufactured by Upper Deck (legal copy on the back of the redemption card will indicate if it was produced by Upper Deck or not). Redemption cards from other manufacturers will NOT BE HONORED. Expired redemption cards must be modern-era redemptions with a scratch off code that has not been scratched. Older redemption cards without a scratch off code are not eligible for this promotion. Expired redemption cards must be for an autograph trading card or signed memorabilia item. Redemption cards for unsigned draft picks, rookie cards, regular cards or memorabilia cannot be honored. Additionally, expired sweepstakes offers are not valid for this promotion either. Upper Deck also has some more activities going on as well, plus some unannounced surprises. For more information be sure to check out the official Upper Deck Blog.